I’m going to break with tradition a bit, for I usually am not one to talk about celebrities that I keep in touch with from photoshoots. Some of this comes out of professional courtesy, and another part of it is that I am a bit of a private person However, a current project and fun day in the studio has made for some new images and behind the scenes video that I think you will all enjoy. 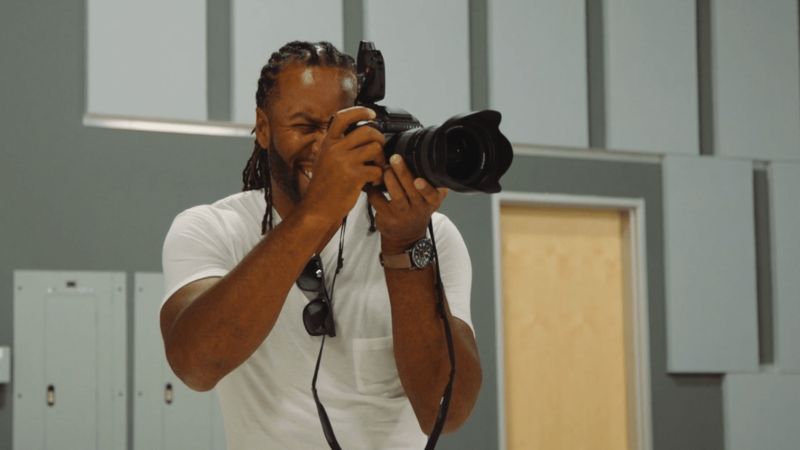 So with that, allow me to talk about the shenanigans that take place when I share the studio with my photographer friend (that plays football), Larry Fitzgerald. The first thing that needs to be known is that Larry is a photographer’s photographer. There are a lot of athletes and celebs out there that like to take pictures. Fitz on the other hand can recite lens history and often is the first person to text me when a new camera is released. The only difference is that he, unlike pretty much every other photographer on Earth, can handhold a Canon 500 f/4 L all day without breaking a sweat. About a month ago, when I was announced as an ambassador for Hasselblad, he sent me a kind text congratulating me, and then a followup text of, “so when we going to the studio again?” The timing of this second text couldn’t have been better, for we were both in town and I wanted to practice some lighting for a shoot the following day. He wanted to check out the H6d-100c and pick my brain on Hasselblad, so we decided to meet up the following week and shoot around (read: camera nerd party). I told Larry the situation and we thought it would be fun to “surprise” her (a little pre-Mother’s Day gift). I wasn’t going to get a football for her (I just don’t ask for autographs, ever), instead I was going to introduce her to Fitz… the photographer. She completely froze…. Speechless. This was one of the single most special memories I have ever had on set. It will always be important to me. Once her words returned, she was able to muster, “You’re Larr?? ?” To which he introduced himself and invited her to the center of the studio so that he could photograph our family’s portrait. Truly a special moment made all the much better by the character and class that Larry has. I want to say a genuine heartfelt Thank You to everyone that made this possible. Larry, the crew, my family… the character of a man is the summation of those around him and you all leave me grateful for your support and great times we have had. Thank You. Blair Bunting is an advertising photographer from Los Angeles. He has won numerous awards and worked with the clients such as Discovery Channel, Pepsi, Disney, Adidas, Nikon, to name a few. If you would like to see more of his work, visit his website, read his blog, follow him on Instagram and Twitter and like his Facebook page. This article was also published here and shared with permission. Fitz is a class act.